Hong Kong is probably one of the easiest places in the world to stay connected, definitely one of the most "wired" cities I have ever been to. Using Hong Kong's extensive network of hotspots providing free Wi Fi is one of the most convenient ways to stay in touch. You find them at major tourist spots, at the airport and all MTR stations for starters, as well as shopping centers, libraries, government offices, and of course McDonalds and Starbucks. Using your mobile phone, likewise, is a straightforward exercise with widespread excellent coverage. If you are used to calls getting dropped or non-existent signals in basements and elevators back home, you are in for a surprise. Signals even in underground stations, lifts and the Cross-Harbour Tunnels are strong in Hong Kong. But in general while staying connected is relatively easy, there are some golden rules so you don't end up with extra charges for roaming and excess usage when you return if you are using your own mobile plan from home. Before going further, it is a new trend that many hotels are getting into lately, and that is they include free use of a smartphone during your stay that provides unlimited local calls and international calls to several countries, as well as unlimited 3G data connectivity and Wi-Fi hotspot. So check first if your hotel will be providing it, in which case, you are all set! One of the most popular ways to stay connected while abroad is through one of the many apps and social networks available through the internet, i.e. 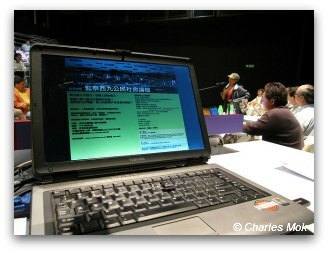 communicating or sharing pictures via e-mail, WhatsApp, Facebook, Skype, WeChat, etc. and while in Hong Kong this should be no problem. Using Hong Kong's vast infrastructure of free wireless coverage is one of your best bets to stay in touch, check e-mails, directions, opening hours or the weather, at your hotel and on the go. The service is available to visitors and there is no registration required, simply log in the network identifier "Wi-Fi.HK". Wi-Fi access is free but some hotspots limit the amount of time to 30 minutes of usage per device. The new common brand of Wi-Fi.HK, pulls together all the previous Wi-Fi operators and public and private organisations that offered the free coverage under their own names. It is much easier now to identify where the free hotspots are by just looking for the new logo. 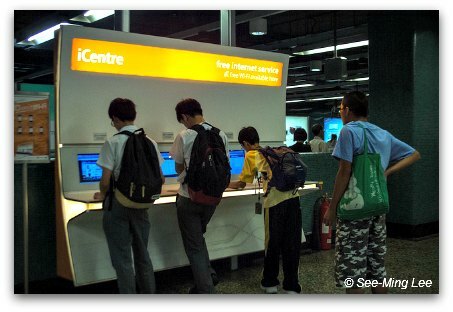 Free Wi-Fi in Hong Kong is available at many tourist spots, MTR stations and transportation hubs, visitor centres, shopping malls, the airport, government offices, college campuses, public libraries, and even some city buses. Look for the hotspots, the phone booths at bus terminus and iCentres at MTR stations, at the Starbucks, McDonalds and Circle K convenience stores . You can download the mobile app to help you find your nearest free wifi hotspot. What is a portable Wi-Fi device? 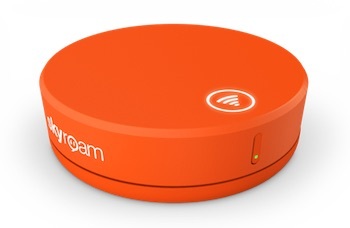 This is a handy gadget that fits in your pocket and enables you to connect up to 5 devices i.e. phones, laptops or tablets, so you can enjoy stable and fast internet connection everywhere you go. If you travel a lot then having your own portable WiFi device that functions in many different countries might make sense. It makes it a lot easier having your own WiFi hotspot as soon as you land, no need to buy SIM cards, pick up local devices and reconfigure your APN settings to get everything working at the airport, just turn on and start surfing. It is also a much safer alternative than the public WiFi spots. The downside of course is the upfront cost of the device itself and in many cases (but not all) rates will be slightly higher than if you had a local SIM card but exponentially cheaper than roaming charges by your home provider. In the case of Hong Kong, some of these plans are comparable or better than the local plans. There are several models, we have the GlocalMe G3 4G LTE Global Hotspot. Upfront cost for the device US$149.99 and can be bought at Amazon.com, Amazon.ca, Amazon.co.uk, Amazon.de, Amazon.fr, Amazon.co.jp, Amazon.com.au. Will my mobile phone from home work in Hong Kong? Very likely but more to the point, it is important to check your existing service provider plan. Many service providers, in the United States in particular, require that international service be activated. If you do not activate it before leaving home, your phone will not work in Hong Kong or any other international destination for that matter. Check the rates you will be charged per phone call and text message. International rates are extremely expensive, even if you are using your phone to call a local Hong Kong number, because your foreign phone is roaming in the Hong Kong cellular network and is charging you international roaming rates. You also pay if you receive a call. Consider signing up for a special international plan that could save you money. Most providers offer plans for two weeks or a month with lower charges per minute, text message and data. Roaming charges may rack up without you even knowing and even if you are not making any calls or sending any text messages. If your phone receives a call for example, even if you don't answer it and goes straight to voice-mail, you may be charged. For European travellers, many providers are doing away with roaming charges and the international plans are quite affordable so this is not much of an issue. If you are planning on using your mobile phone or 3G-enabled iPad or tablet a lot, getting a local Hong Kong SIM card might make more sense and is an easy straight-forward process. 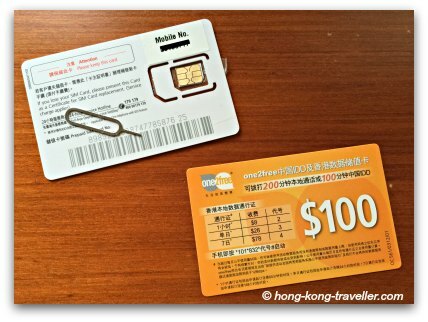 You can buy a prepaid SIM card in Hong Kong at any of the local telecom outlets throughout the city and easily install it into your mobile phone or tablet, this is a great way to save money if you will be using your phone a lot. You must have an unlocked phone for this to work. What's an unlocked phone? It is a phone that can be used on any network. Many U.S. carriers in particular "lock" the phones you buy through their plans so they can only be used on their networks for as long as you have a contract (normally 2 years). Most phones sold in Europe and Asia are unlocked. At any rate, if you have no outstanding contract, you should be able to have your carrier "unlock" your phone. Even when you have a contract they agree to unlock it temporarily for the duration of your trip. If you have a locked phone, you can also consider a portable wifi device (see above) that enables you to connect up to 5 devices including your locked phone, tablets, notebooks, etc. at substantially lower rates than your roaming charges from your home carrier. In Hong Kong, there are many network providers including China Mobile, PCCW, CSL, SmarTone, 3 Hong Kong, One2Free, etc. Getting a SIM card is as easy as dropping by one of the many kiosks and outlets throughout the city or at the airport, 7-elevens and even at vending machines all around town. Their prepaid and pay-as-you-go plans are convenient for short-term travelers. Make sure you get the right size SIM card for your phone or tablet. Iphone 4 uses the Micro-Sim, Iphone 5 and 6 the smaller Nano-Sim Card. iPads 2 through 4 use the Micro-Sim, the iPad mini and Air use the Nano-Sim. The latest Samsung Smartphones use the Micro-Sim, the oldest models use the traditional SIM card. One of the easiest alternatives with great rates is the Tourist SIM Card offered by the Hong Kong Tourism Board. Issued in conjunction with PCCW, there are no subscription or registration charges, just plug in and you're set. You can choose from a 5-day (HK88, about US$11 ) and 8-day card (HK118, about US$15), there is also an option that includes Macau. You can get the Discover Hong Kong SIM card at any PCCW/CSL outlet, HKTB TST Star Ferry Visitor Centre, 7-eleven and Circle K convenience stores including the outlets at the arrivals hall at the airport. The online booking process is quite simple, just select the number of days and Sim card size required, you will get an email voucher/confirmation which you redeem at the airport where you pick up your card. The counter is conveniently located at the arrivals area and the guy at the counter did all the swaping and activation for all our phones and made sure everything was working as it should, in a matter of minutes we were on our way. Offers change every now and then. We had a 7-day 3G card, coverage was quite good, worked perfectly everywhere we went including the MTR. Service was a little spotty once we were out in the marshes in the New Territories, but other than that, it worked seamlessly throughout Hong Kong. It was seven 24-hour days, not calendar days, which unlike other services, if you buy yours at 9:00 pm on a Sunday, that Sunday counts as one day. We got ours on a Sunday at 4:00 pm and it expired the next Sunday before 4:00 pm. Some can be used in Hong Kong, Macau, Mainland China, Japan and Taiwan, useful if you will be travelling to several of these places. Electricity in Hong Kong is 220-240 Volts. This is twice the standard voltage than in North America and some Latin American countries which run on 110V. The standard wall plugs in most households in Hong Kong are the British and Indian style sockets. Find out what you will need to charge all of your devices including cameras, phones, tablets, laptops, etc.